I \ tions and accessories to meet most of your sealed connector needs. Everything for professional UHP surface preparation: eleptafc and diesel high pressure pumps, surface prep control guns, fittings, hoses and nozzles. On the Cover: Hydrex has almost 30 years of experience in underwater ship repair and maintenance. With headquarters in Europe, branch offices and equipment support bases around the globe, the company provides an expe- dient alternative to dry dock without compromising the quality of repairs. Hydrex carries out all repairs (to class-approved specifications) within a tight time-frame so that ships stay as close to schedule as possible. Ship Repair & Conversion 26 The Saga Continues: The nearly 40-day Castor saga has sent a wake-up call to the world regarding ships in distress and ports of safe haven. 28 Craft Bearing on Solid Ground: Craft Bearing used its Split Roller Bearing to turn an ordinary pipe into a precision drive shaft. 29 UMC Goes Underwater: Specializing in under- water maintenance, UMC International has estab- lished a new ship repair facility in Portland, U.K. 43 Double Trouble? All rights reserved. No part of this publication may be reproduced or transmitted in any form or by any means mechanical, photocopying, recording or oth- erwise without the prior written permission of the publishers. CT 06701 and additional mailing offices. Street, New York, NY 10010. Distribution) Sales Agreement No. 0970700. Printed in U.S.A.
Publishers are not responsible for the safekeeping or return of editorial material. 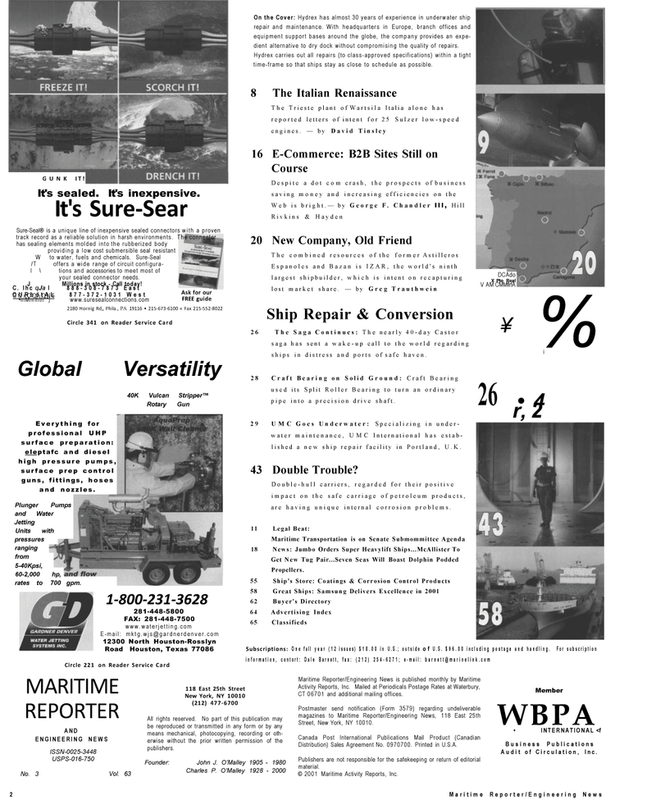 © 2001 Maritime Activity Reports, Inc.